In the previous example we created a basic IVR system written in C# by using the tools and functions of the Ozeki VoIP SIP SDK. In this program we made a softphone for our IVR and registered it to the PBX. After the registration and the creation of the phone line we made a class to manage the calls. In this class we set that if there is an incoming call, then the user hears a welcome message and he/she able to control the IVR by using DTMF buttons. If you click on the following link, you can reach the full description of the Basic IVR example code. In these example programs you will be able to add numbers to the console application for using the blind transferring functionality and you can control your IVR system by using your voice if you would like to modernize your system with this feature. 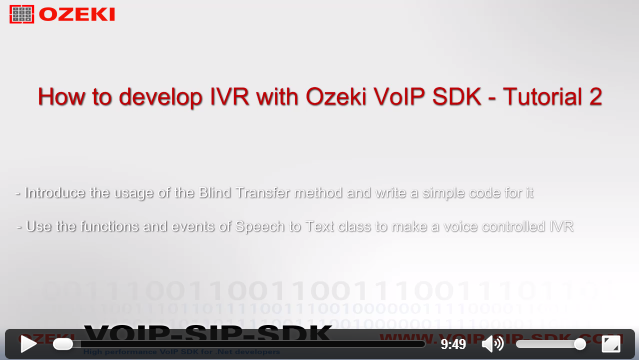 For the source code of the Blind transferer IVR, please click here! For the source code of the Voice controlled IVR, please click here! This class is for handling the incoming calls of the IVR and managing the IVR menu options. Our class with the Main() method, this class controls the console window, interacts with the user, by using softphone and callhandler objects. You only need to modify the Program and CallHandler classes of the Basic IVR code. In the Program.cs the user has to add a number to the system which will be the number what he/she would like to reach via the Blind transfer option. After the input request the code needs to pass this value to the CallHandler.cs. Create a static string type variable called blindTransfer. It is static because you will use this value in more than one methods of the Program class. Add two lines to the Main() method. The first is to inform the user that he/she must add a number for the system to use the Blind transferring functionality. If he/she does not want to use this option, then press '0'. The second code line is for reading a value from the user and storeing it in the blindTransfer variable. The Read() function has two parameters: the name of the variable name in string format, the second is a bool. If it is true, then the racall will continue until the input is not null or empty. If your variable contains the added number then the system needs to pass this value to the CallHandler class and you can do this by calling a method in the softphone_IncomingCall section of the Program class because there you can find a CallHandler object. With this you can pass the blindTransfer value to the CallHandler class. But this method doesen't exist yet, so you need to create it in the CallHandler.cs. Now create the BlindTransferNumber method what you called in the Program.cs. The parameter is the value from the Program class and the new blindTransferNumber will be equal with this. So you can work with this value in this class now. The only thing left is add a new case to the switch statement in the call_DtmfReceived method and check that if the value of the blindTransferNumber is 0 or anything else. If it 0, then inform the user that he/she can't use the blind transfer function because he/she didn't add any number for it. Else call the BlindTransfer method with the blindTransferNumber value. In this example we are going to create an IVR, which can be controlled by human speech so it is not needed to press any BTMF buttons to navigate between the IVR menu items. For this you only need to modify the CallHandler class of the basic IVR source code and implement the events and methods of the SpeechToText abstract class. We will manage the incoming calls for the IVR here, just like we did in the Basic IVR and Blind transfer IVR example codes. You should create some new objects: a PhoneCallAudioReceiver for receiving audio from the caller, an IEnumerable for giving word options to the system to recognize them and a SpeechToText to convert the human speech into text format. In this section you need to set the created object and make instances for them. The PhoneCallAudioReceiver needs to be atttached to the call, and you need to create an instance for the SpeechToText via the CreateInstance method of the SpeechToText class. You also need to add some words to the choices list what will help to the system recognize words. In the Start() method you need to connect the PhoneCallAudioReceiver to the stt with the help of the mediaConnector. This is for giving the human speech to the recognizing section. And you have to subscribe on the WordHypothesized event of the SpeechToText class. If the system detects the user speaking and the reconized word fits one the words in the choices list, then it starts the CallHandler_WordHypothesized() method which handles the the switch statement. If the user says "first", he/she can hear some information about the Ozeki Ltd. and the Ozeki VoIP SDK. By saying "second" , he/she can hear a sample mp3 song. As you can see, with the help of these examples, you can create and modernize your IVR system by using Ozeki VoIP SIP SDK. Now you are able to use the Blind Transfer method and the components of the SpeechToText class if you would like to control your IVR system via human speech.